How am I felling today? 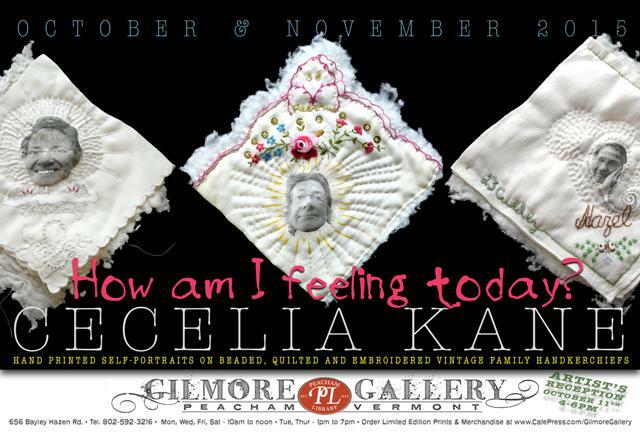 In 2012, as part of my self-portrait series, How Am I Feeling Today?, I laser printed miniature photos of my face on 89 vintage family handkerchiefs. The original photographs were taken in 2009 staring into my bathroom mirror, with my felling of the moment written in lipstick on my forehead. I am currently quilting, beading and embroidering these hankies that I had worn as a child in the breast pocket of my Catholic grammar school uniform. I am asking myself the questions, Who Am I? Am I my thoughts and feelings? Significantly, 89 is the number of years my mother lived. The needlework is in progress. On view are 36 of the 89 hankie portraits that I have completed to date. There was an artist reception Sunday, October 11, 4 – 6pm.